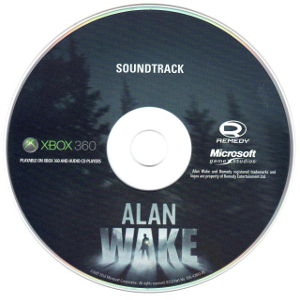 On May 14, Remedy Entertainment’s Alan Wake was at last released by Microsoft Game Studios for the Xbox 360. The eagerly anticipated action thriller video game has been described as the successor to Max Payne and already looks set to top sales charts. The game’s score featured a selection of intimate orchestral music composed by newcomer Petri Alanko and recorded in Germany. The music of several indie artists was also carefully licensed for the game, most notably Poets of the Fall, who contributed three pieces. One of the bonuses with the limited edition version of the game was a soundtrack featuring ten of the most substantial original and licensed entries on the score. Is it worth the pricetag? The first tracks that I would like to point out are a selection of semi-licensed additions. In game music, when licensed music is involved, it’s too often they are thrown together to create non-descriptive and disappointing mash-up soundtracks. In Alan Wake, though, you’ll find that the contributions from the semi-licensed artists are especially well-selected, and different to what you would expect to hear in any other game. The first featured are a couple of neo-psychedelic tracks from The Black Angels and Anomie Belle. “Young Men Dead” from The Black Angels is a fantastic example of a mind warping track. Dominated by Alex Maas’s dry vocals and a bizarre guitar riff, it excels through its simplicity. Less rock-centred, Anomie Belle’s politically inspired “How Can I Be Sure” rather takes upon a hypnotic downtempo style, concentrating on a trippy electronica beat and provocative vocals.